Provide comfort for the family of Gloria Ballantyne with a meaningful gesture of sympathy. 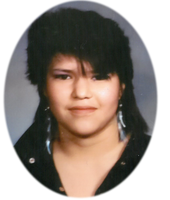 It is with great sadness that we announce the passing of Gloria Ann Ballantyne late of Sturgeon Lake, SK. Gloria entered into rest on February 23, 2019 at the age of 47 years in Prince Albert, SK. Gloria, also known as “Mooch”, was born to parents: Martin Ballantyne and Gloria Daniels; on July 12, 1971 in Prince Albert, SK. She is survived by her children: Nikki (Terence) Thomas, Kyron (Desire) Ballantyne, Rachel (Darren) Badger, Dakota Ballantyne, Serena (Gilbert) Daniels and Janelle Ross; her grandchildren: Honey, Thor, Kali, Keaston, Eva, Kai, Jackson, Dawson, Matthew, Odin, Aysen and Aybree; her mom: Gloria (Vincent) Daniels; her step-mom: Helen Ballantyne (Tilly); her sisters: Sharon (Gordon) Jim, Lisa (Mark) Bighead, Melissa (Cedric) Bighead, Drew Ballantyne, Tayna (Wendell) Ballantyne, Sonya (Mike) Osborne, Kim Daniels, Holly (Roland) Daniels and Candace McKenzie; her brothers: Ashley Ballantyne, Charlie Ermine and Clinton Arcand; her step brothers: Curtis Daniels, Harley Daniels and Adrian Daniels; her special aunt: Audrey Ermine; her special friend: Merril Fiddler; and numerous aunts, uncles and cousins. Gloria is predeceased by her dad: Martin Ballantyne; her grandparents: Austin & Melvina Ballantyne (Paternal) and Allan & Mae Bear (Maternal); her special friend: Dennis Ross. A Wake Service will be held on February 24 & 25 at the Sturgeon Lake School Gymnasium, located in Sturgeon Lake, SK. A Funeral Service will be held in Gloria’s honour on Thursday February 28, 2019 at 11:00AM at the Sturgeon Lake School Gymnasium, in Sturgeon Lake, SK. Internment will follow at the East End Cemetery in Sturgeon Lake, SK. Arrangements in care of MacKenzie Chapel & Crematorium Brian and Bev Stobbs, Renée Phaneuf - Funeral Directors. www.MacKenzieChapel.ca 306.763.8488. To send flowers in memory of Gloria Ann "Mooch" Ballantyne, please visit our Heartfelt Sympathies Store.